Being a teacher or a volunteer is hard work! Show your appreciation by gifting items and experiences they will want to receive. A Farmer’s Market Treat - What’s a local treat your area is known for? Is there a local lavender farm? A specialty chocolate shop? Check out your weekend farmer’s market for some easy ideas. A Box of Local Chocolates - Most cities have a local chocolate shop where you can grab a sweetly wrapped box of goodies. Bonus: when you buy local, the treats are usually fresher — and taste that much better. Local Restaurant Gift Card - Buy them a gift card to visit that new burger joint, wine bar or pasta restaurant and pat yourself on the back for giving them the gift of a new experience. Fresh Treats from a Local Bakery - Check what’s in your area. Do you have an incredible French patisserie? A delicious donut shop? Find it and select a box of their best, wrap it in a big satin bow, and give it as a gift. Coffee Gift Basket - If your teacher or volunteer enjoys coffee, they’d probably love a gift basket of high-quality coffee and candy goodies. Include a mug, fresh coffee beans, coffee flavored chocolates and honey straws. Smoothie Gift Card - Not every teacher or volunteer drinks coffee. See if you ever notice them carrying a coffee mug and if you don’t — consider giving them a gift card for smoothies. Everyone loves a fruity smoothie! Baking Gift Basket - Put some fun baking tools, cookie cutters and other baking goodies in a basket and give them the gift of fun baking time. Movie Night Bucket - Grab a popcorn bucket and fill it with popular movie snacks and an Amazon gift card for a movie rental. Who doesn’t love a good movie night? New Cookbook - Wrap a delicious-looking cookbook in a big bow and spice up their dinners for the next semester. Cookies in a Jar - Have you seen those mason jars that are pre-filled with all the dry ingredients you need to make cookies? Wrap one with a bow and a tie a cookie cutter to the tag and voila! Easy gift and a yummy cookie night. Breakfast Basket - This also makes a fantastic gift for a hostess. Put some dry mix for scones, some jams, breakfast treats and maybe some coffee or tea. They’ll enjoy a relaxed morning and think of you. Scarf - A scarf makes a timeless, thoughtful gift. Necklace - As long as you go with something neutral, this is a great gift. Everyone appreciates a new accessory to mix and match with their wardrobe. Rare Edition Book - Go to a used bookstore and look for the leather-bound rare edition books in the front. Find one in the subject matter of interest to the volunteer and start negotiating. These one-of-a-kind rare books will be something they will cherish. Garden Herb Plant - This is such a fun gift, especially if your volunteers enjoy cooking. They can grow their little herb plant and use it to freshen their favorite recipes. Monogrammed Coasters - Everyone uses coasters — who can’t use a fun new set? Gift them a personalized set with the first letter of their last name. Slippers - Often teachers and volunteers spend hours at a time on their feet. Give a fluffy pair of slippers to wear when they get home. Reading Socks - Barnes & Noble now carries these big, fluffy socks called Reading Socks. They make a cozy gift when paired with a new book. Soft, Cozy Blanket – A super-soft blanket is an affordable and universally-appreciated gift. Coffee Gift Card - That daily latte habit is pricey, especially on a teacher’s salary. They’ll appreciate you picking up the tab for their caffeine habit. A Themed Gift - Ask your child what their teacher talks about a lot or what authors and topics they say are their favorite. For example, if their English teacher likes Edgar Allen Poe, you can choose a few cool Poe-themed gifts, such as a raven statue, a Poe coffee mug or a Poe bobble head! A Memory Book - Buy a memory book and have your child pass it around to students in the class to write a special memory or note to the teacher. This is a sentimental gift that they’ll be sure to treasure forever. Fresh Flowers - Who doesn’t love bright blooms? If you tell the florist they are for your favorite teacher, they will probably throw in some extra flowers. Just make sure they’re in a vase with enough water to last until they are home for the day. A Beautiful Picture Frame - Your teacher likely has some favorite memories from this year, so why not give them a nice place to store one? Adult Coloring Kit - Studies have shown adult coloring books to reduce anxiety and stress. What teacher doesn’t need that? Pick up an adult coloring book and colored pencils to give them something to do when they need a break from grading. Pedicure or Nail Certificate - Chances are strong your favorite teacher gets their nails done as a way to unwind (or wishes they could). Cover the cost of their next pedicure by picking up a certificate at a local nail salon. Journal - There are so many options here, so you can really customize this to their teacher’s personality. From beautiful, decorative journals to funny ones, you’ll be sure to find one that encapsulates the recipient. Bookstore Gift Card - Browsing a bookstore is probably one way your favorite educator unwinds. Give them a gift card to pick up something new. The gift of a book also gives the gift of quiet reading time. Who doesn’t want that? Reusable Water Bottle - Grab a Swell reusable water bottle and attach a card that says, “You’re Swell!” Or, let your child pick one that they feel has a pattern or color that their teacher would like and give them the gift of hydration. Nice Candle - A lovely soy or coconut wax candle fragranced with essential oils is a wonderful gift for a teacher to use at home. Coffee or Tea Tumbler - There are so many options to choose from here. Look for tumblers with fun phrases on them such as “I teach — what’s your superpower?” Even if their teacher doesn’t drink coffee, a tumbler will keep any beverage hot or cold and is a practical gift. Books for the Classroom - Chances are good that this teacher wishes they could add to their classroom library. A donation of age-appropriate books or a gift card to buy some is a great gift. Polaroid Camera - Everyone loves snapping pictures of moments to remember, but teachers lack time to upload and print pictures. Give them an instant camera and film so they can immediately pin classroom pics to a memory board. Nice Pen - Despite the high use of computers, teachers still handwrite all the time. Buy them a beautiful, heavyweight pen to write all those notes. Monogrammed Bag - Teachers have to tote a lot of stuff! Give them a new personalized bag to free their hands. Game for the Classroom - Teachers are always on the hunt for fun classroom games. Find a new activity or group game for their subject and grade level and watch their eyes light up when they imagine the fun the whole class will have. Hand Lotion Set - You wouldn’t believe how many times a day a teacher washes their hands! A moisturizing set of lotions would make a great gift. Just make sure they’re not fragrant, as most schools have policies against using scented items. A Bonsai Plant for the Classroom - A bonsai plant would be an excellent gift for any teacher and a refreshing piece of decor for the classroom if they didn’t have a place for it at home. Personalized Stationery - Teachers go through many notepads, sticky notes and notecards over the years. Take the opportunity to make custom notecards teachers will treasure. Tie or Bow Tie - Teachers often battle for bragging rights to wearing the coolest tie or bow tie. Consider giving one as a gift to your well-dressed teacher. Classroom Donation - Many teachers have set up donation sites online where they request funds for items they feel would enrich their classroom. Give your teacher a donation to fulfill their classroom wish list and everyone wins. Genius Tip: Make it even easier for your teacher by creating a classroom wish list sign up for them. Themed Quotes Calendar - We’ve all seen these, but they can be so fun for a classroom. Consider matching the teacher’s subject matter to the calendar theme. Give a Shakespeare one to your English teacher, historical facts for a history teacher and a favorite musician calendar to your music teacher. The sky is the limit! Movie Theater Passes - Movies for a whole family are expensive, but everybody loves to go. Give the gift of family quality time with free passes. 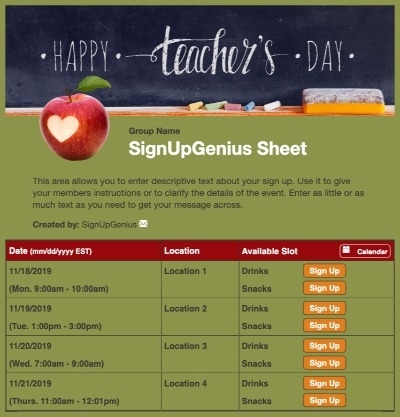 Coffee and Treat Cart - Get a group of parents together from your class or even several classes. Put together a pushcart with some fresh coffee, cream and sugar, and some fruit and pastries and go to each classroom and serve them up! 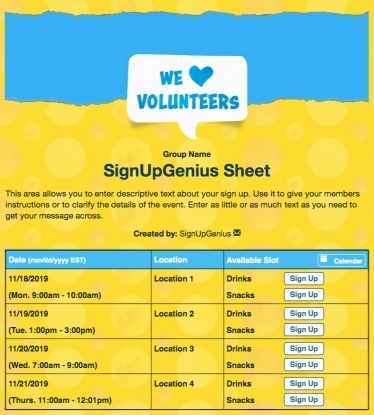 Staff Potluck - Work with other parents to form a committee, create an online sign up for meals and put on a potluck luncheon for the entire school staff! Everyone loves to eat, but many teachers eat in their classrooms while they work. A relaxing opportunity to eat and chat is a welcome break for everyone. Donuts and Fruit for Staff - Rather than getting individual gifts for your group of teachers, go in on donuts and fruit for the staff with some other parents. Gift Basket of Classroom Supplies - Every semester a teacher uses a variety of school supplies in bulk. Give a gift basket of glue sticks, paper, construction paper, markers, pencils and more. Spa Gift Certificate - A spa experience is like winning the lottery to a hardworking teacher. Give the gift of relaxation. Choosing a gift for your favorite teacher or volunteer shouldn’t be a chore. With these 50 school-approved ideas, you will find something you’ll love to give and they’ll love to receive. Keep this list somewhere safe for years to come — and make sure to share it with your friends! Erica Jabali is a freelance writer and blogs over at ispyfabulous.com. 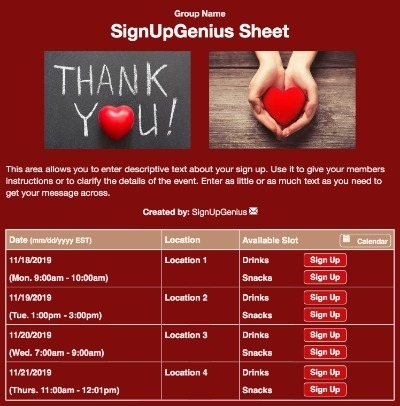 Organize volunteers for events, fairs and more with a sign up.